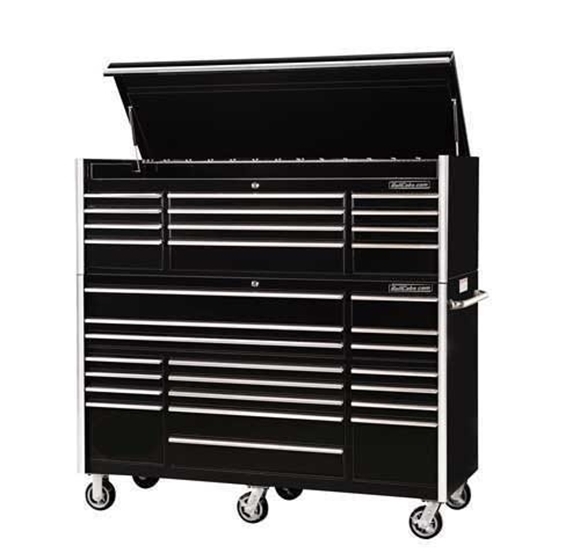 CRX722531SET Combo features a 72" rolling tool box and a 72" top tool chest. 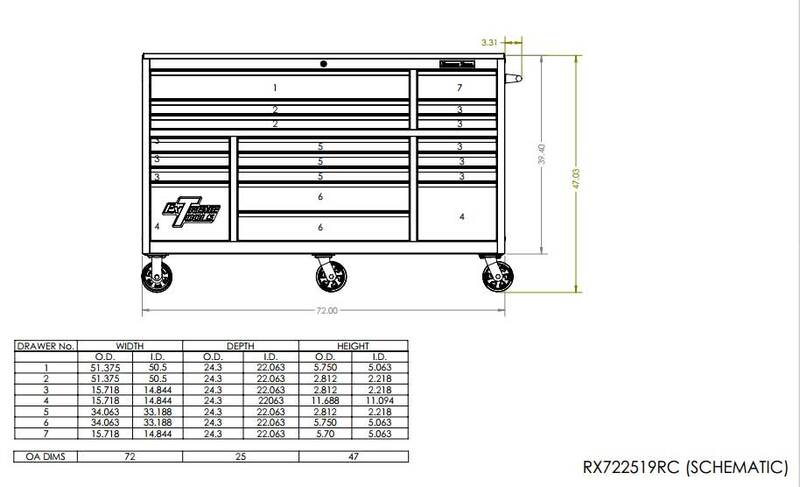 CRX722531SET is a 72" Tool box set that includes 19 drawer 72" rolling tool box and a 72" top tool chest. 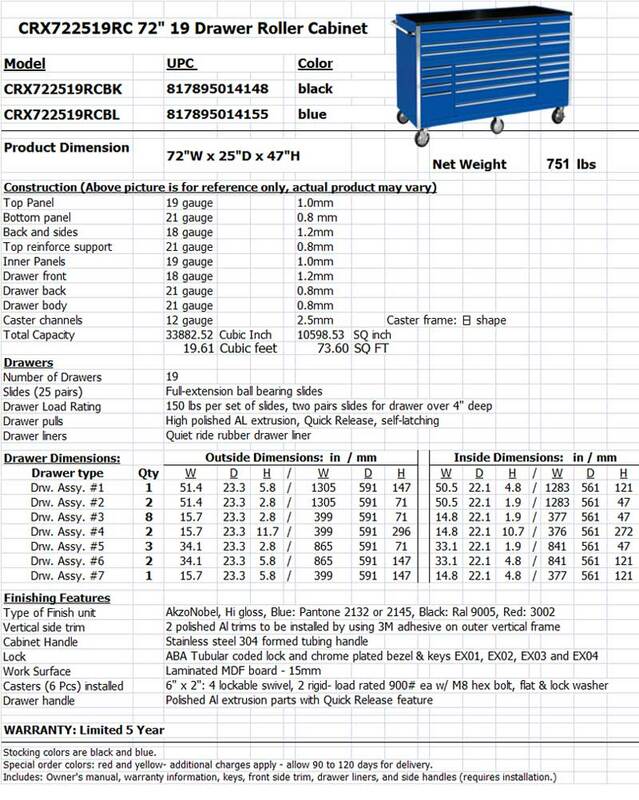 Drawer Load Rating: 150 lbs per set of slides - 2 pairs of slides for drawers over 4"
*** RollCabs.com CRX722519RC is built by Extreme Tools and carries the same warranty as the Extreme RX722519RC. 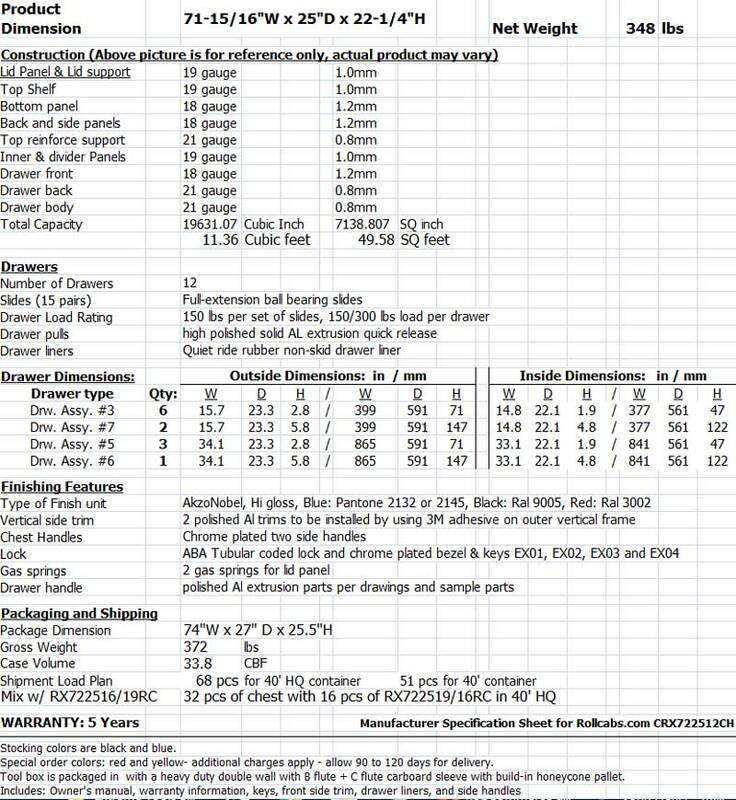 All drawer slides in the CRX722519RC are rated @ 150 lbs per pair rather than standard 100 lbs per pair found on the Extreme RX722519RC. 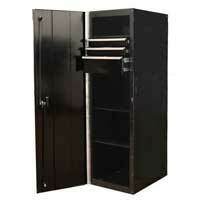 *** RollCabs.com CRX722512CH is built by Extreme Tools and carries the same warranty as the Extreme RX722512CH. 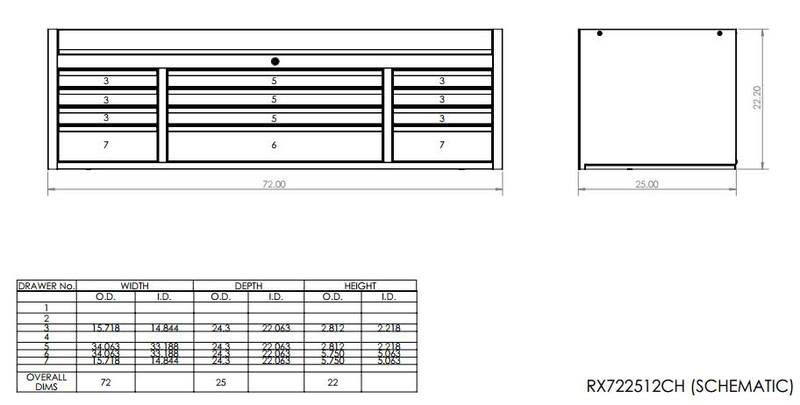 All drawer slides in the CRX722512CH are rated @ 150 lbs per pair rather than standard 100 lbs per pair found on the Extreme RX722512CH..
Love it. Just bought the black triple bank top and bottom it's a ton of storage for the buck everything seems to be high quality and just as good as snap on and MAC. New box, came packaged really well. 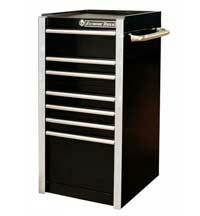 And seems to be on par with other boxes, even impressive next to my coworkers $20000 snapon toolbox with side cabinet. Love it. So glad I pulled the trigger on the 72”. Being able to organize so I can find everything was huge. Thanks again. 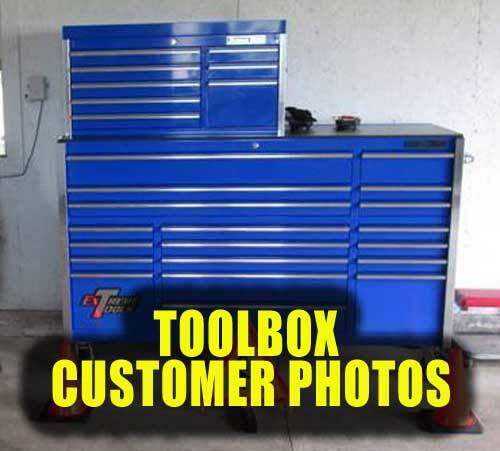 I purchased a RollCabs toolbox from them a few months ago (CRX722519RC). I have zero complaints with the box and love it. I’ve owned “name brand” boxes in the past and would definitely say the construction and quality is comparable. I love the fact that they have a ton of inventory so I didn’t have to wait and also could look one over before purchasing. 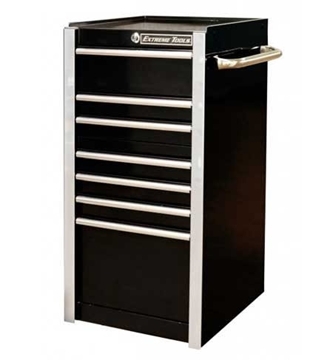 You will not be disappointed in these boxes and I literally saved thousands compared to a tool truck! 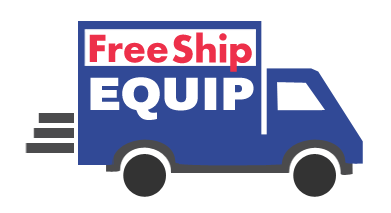 Highly recommend doing business with them.